Amatrol’s ET200 RFID Learning System (89-RFET200) covers RFID (Radio-frequency identification) technology and it’s applications with Safety PLCs typically used in process manufacturing, assembly, conveyors, and transportation. RFID, which uses radio waves to identify objects, is gaining popularity within industry because of exceptional read distance and reliability, tags that are less susceptible to damage than printed barcodes, and the ability to track and record product manufacturing history. The 89-RFET200 provides comprehensive RFID curriculum that explains RF170C interface module operation and configuration, project configuration, and data exchange. Major components of the 89-RFET200 include an ET200PRO RFID application panel, RF reader module, and RF170C communications module. This learning system adds to Amatrol’s Programmable Controller Troubleshooting (890-PEC-B) and requires the PLC Troubleshooting Learning System – Siemens ET200Pro – Safety (890-ET200SF) and Safety I/O with Reversing Starter (89-ET200RM). In addition to hardware and curriculum, the 89-RFET200 includes an instructor’s guide and install guide. The 89-RFET200 features a variety of industrial components for hands-on practice and skill-building. These components include an ET200PRO RFID application panel, ET200PRO RF reader module, RF170C communications module, and two RF tag modules. Used in conjunction with additional required learning systems, the 89-RFET200 allows learners to build skills like: identifying the components of an RF170C RFID system; configuring an RF170C interface module in a STEP 7 project and an ET200PRO RFID PLC project; resetting the RFID system and initializing a tag; and exchanging data with a tag. The 89-RFET200 includes Amatrol’s world-renowned curriculum that builds theoretical knowledge in order to understand RFID function, components, operation, and applications. This knowledge is then immediately reinforced by the practice of applicable hands-on skills. Examples of topics covered by this learning system include: exploring seven considerations when selecting RFID systems; describing the operation of an RF170C interface module and RF340R read/write device; understanding how to initialize a tag; and learning how to use a variable table (VAT). Only Amatrol Teaches RFID Skills with a Safety PLC! 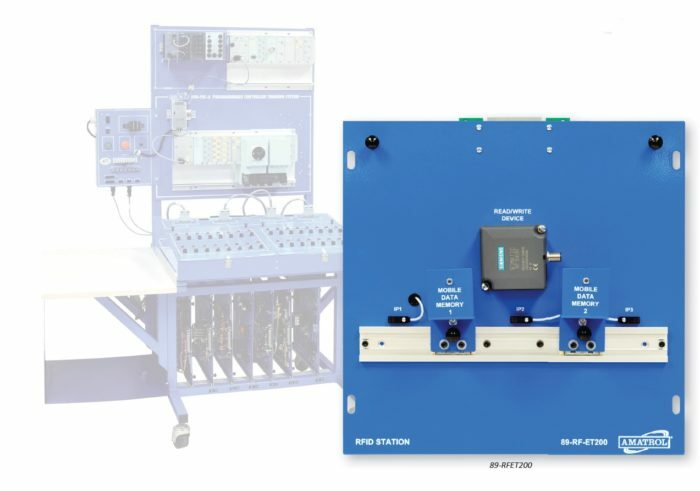 This learning system is used in conjunction with Amatrol’s PLC Troubleshooting Learning System – Siemens ET200Pro – Safety (890-ET200SF) to add RFID knowledge and skills to the only training system featuring a Safety PLC. Safety PLCs provides safe operation of a machine or process by improving fault detection and diagnostics in automated systems, enabling production to resume quickly following a safety related interruption. The 890-ET200SF teaches general PLC programming, operation, and troubleshooting in safety PLC applications. In addition to the RFID learning system, the 890-ET200SF features an array of safety PLC learning options. Additional learning systems include: ET200S Stack Light Learning System (89-SLET200), PLC HMI Learning System – Siemens ET200, (89-HMIET200), and ET200PRO Profi net Pneumatic Learning System (89-EPN1).